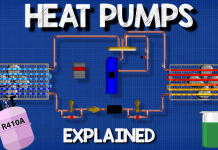 Guide to heat pumps. In this article we’ll be looking at how to select and compare different heat pumps and how to decide which heat pump is best for you. We look at air source heat pumps, ground source heat pumps and water source heat pumps. Considering some pros and cons as well as the installation costs and comparing efficiency ratings. Get access to all the resources you need to improve your heat pumps. Visit the Danfoss webpage for free business cases, case stories, eLessons, diagrams, and a wide product portfolio for residential and commercial heat pumps. 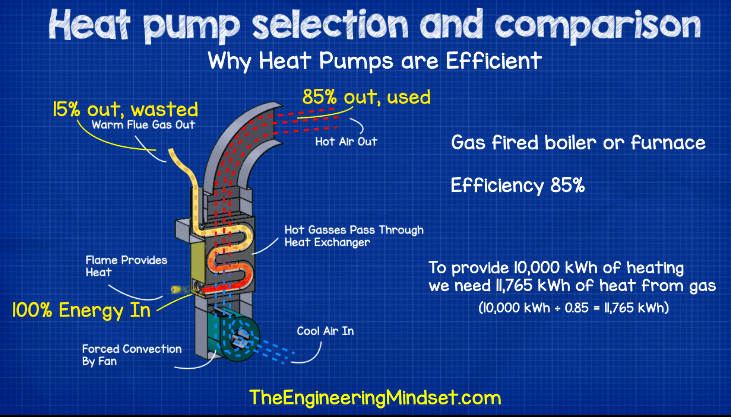 Now in the last heat pump article we looked at the different types of heat pumps and how each type worked. 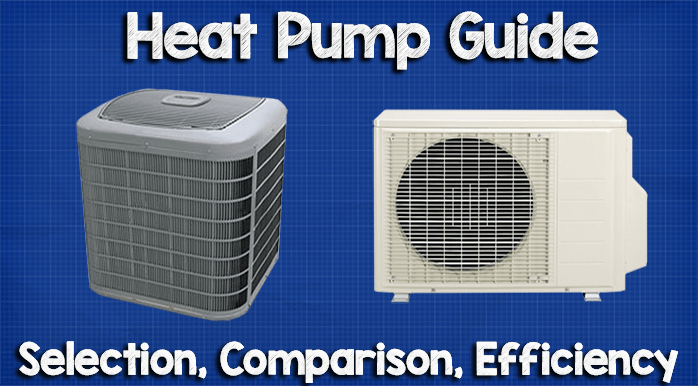 In this video we’re looking at how to select one and how to compare different heat pumps. You can view the previous heat pump article by clicking here. If we look at conventional heating methods. A gas boiler or furnace, has an efficiency of say 0.85% so to provide 10,000 kWh of heating over the heating season, we need to input 11,765 kWh of energy from gas, that’s because we need to combust fuel and then try to capture any heat it produces before it leaves the flue, inevitably we can not capture it all so a lot of it will go to waste. An electrical heater is 100% efficient so to provide 10,000 kWh of heating we need 10,000 kWh of electricity. For this we’re turning electricity directly into heat through resistance. We can’t get more heat out then the energy we put in so we only get 10,000 kWh out. An air source heat pump is maybe 400% efficient in comparison (i.e it has a COP of 4, we’ll see what that means later on), so to provide 10,000 kWh of heating we need to input 2,500 kWh of electricity. Sounds magical right? Well there’s no such thing as magic. What that means is we will use 1 kWh of electricity to capture 3 kWh of heat from the outside ambient air and produce 4 kW of heat. The electricity is used by the compressor to send refrigerant around the system and capture the heat from outside, then bring it inside. It can do this because the refrigerant has an extremely low boiling point. For example, water boils at 100°C (212°F) and as it boils it carries heat away as steam. 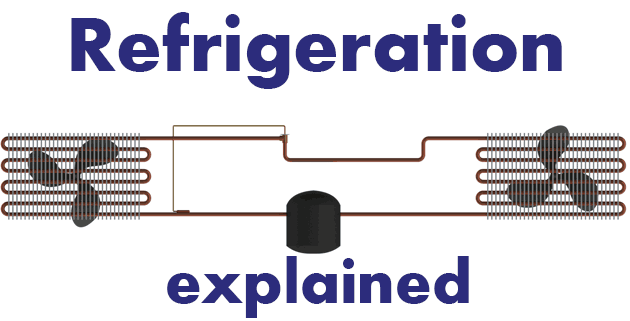 Refrigerants have a much lower boiling point, for example R134a boils at -26.3°C (-15.34°F) and R410A boils at -48.5°C (-55.3°F) so even when the air outside is very cold we can still capture enough energy to cause the refrigerant to boil and as it boils it carries the thermal energy away and into the building. Obviously the warmer the air outside then the more thermal energy there is to capture and at a certain point it becomes uneconomical for the cost of electricity consumption to capture the energy. Which heat pump should you get? First we need to decide if we want to provide hot water or hot air to the property. If air then do we also want it to provide cooling during the summer? Do we have access to a lake or river? If not then we can’t use water source. Will the heat pump be installed into a new or existing property. If existing, then we probably need to install larger radiators or underfloor heating to maximise the heat as it is a lower temperature than a conventional boiler. We also need to consider our budget as the costs vary by type. 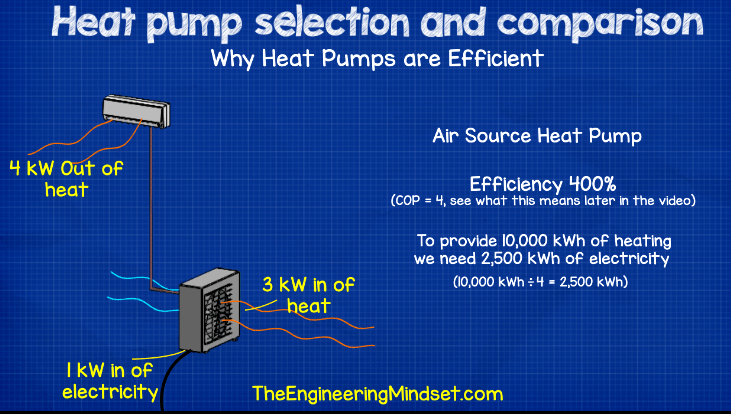 Then we can decide if an air source, ground source or water source heat pump is best for us. Air source is the quickest and easiest to install and it looks like a normal air conditioning unit. You can use these units to generate hot water or hot air, some units can also incorporate a reversing valve to operate in cooling mode also. We’ve covered how reversing valves work in our previous tutorial, click here to view that. The air source heat pump unit is installed outside and keep in mind that it will create some noise from the fans and compressors. They need access to ambient air so don’t box them in else this will cause re circulation and you’ll be trying to extract energy from air that you’ve just extracted energy from which isn’t efficient and is going to waste electricity. These units are the cheapest to install but they’re typically the least efficient because air has a low density and heat capacity compared to soil or water. 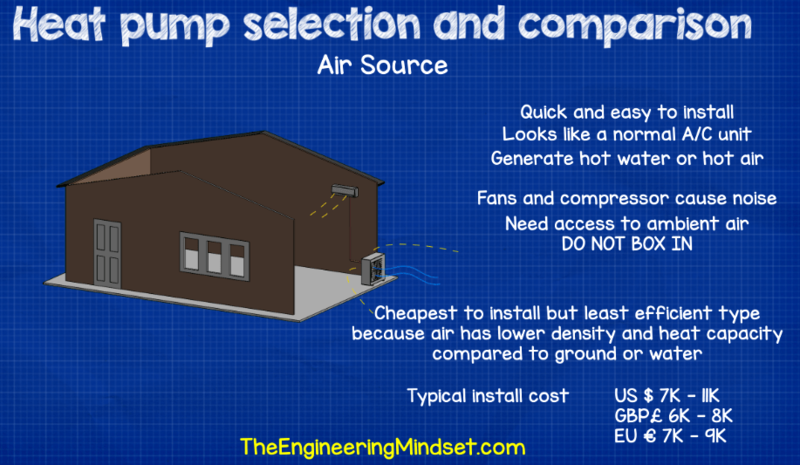 Approximate costs to install an air source heat pump system, something in the range of US$7,000 – 11,000 : £6,000 – 8,000 : € 7,000 – 9,000 this is going to dramatically vary depending on location, complexity, size etc. 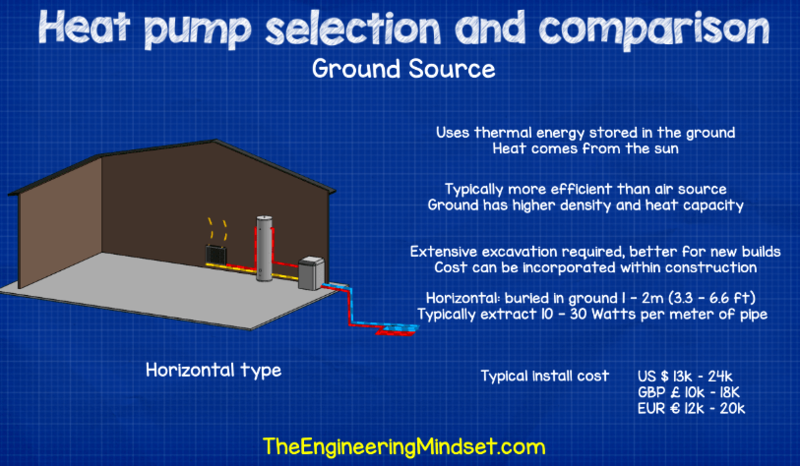 Ground source is the second most popular option, its more commonly used for hot water production but you can also get units and systems that can reverse to provide cooling. It uses thermal energy embedded within the ground that comes from the sun. This option is typically more efficient than air source because the ground has a higher density and heat capacity compared to air. This option requires extensive excavation however, so it’s best suited to new builds as it can be incorporated within the construction to reduce costs. The horizontal type uses pipes buried in the ground at around 1 – 2 m (3.3 – 6.6Ft) and you’ll be able to typically extract 10-30 Watts per meter of pipe, depending on ground type. Install costs are typically US$13k – 24k : £10k – 18K : €12k – 20k but this will dramatically vary with location, complexity and size. If you don’t have access to a lot of land then we have the vertical type which uses a loop of pipe placed in deep vertical holes. The holes are typically somewhere between 15 and 150m deep (50 – 492 Ft) and you can typically extract 10 – 50 Watts per meter, depending on ground type and water content. Install costs are typically US$18K – 32K : £14K – 24K : €16K – 27K again, dramatically varying with location, complexity and size. The third option we have is water source. This is the least common type simply because the property needs access to a lake or river. For this type, there are two options, either open or closed loop. Closed loop uses a water + anti-freeze mix to cycle around and capture the heat. Alternatively, we have open type which pulls in water from the source, extracts the energy and then releases this water back into the source some distance away. This type usually has stricter permissions required from the local authority, consider also that if the system leaks and the refrigerant or anti-freeze gets into the water source, it’s going to be toxic for the wildlife and you might even receive a fine from the environmental protection agency. It’s pretty rare for it to leak though but it has happened. 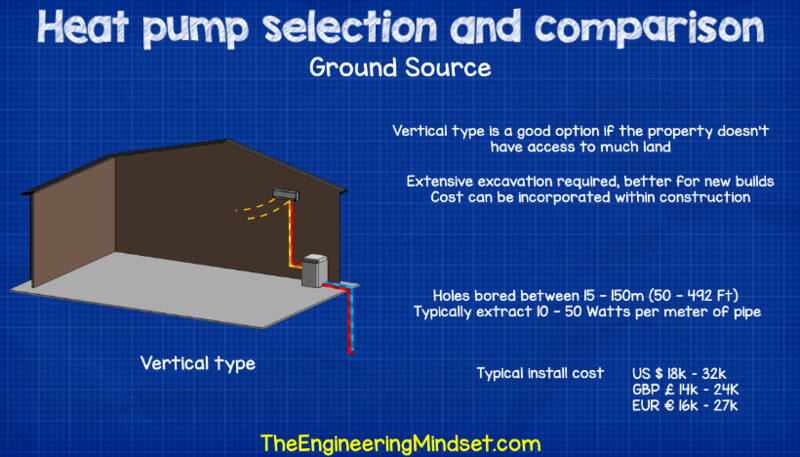 However, this option is very efficient, more so than air or ground source. The pipes are constantly surrounded by water and the current and flow of water means the energy source is constantly replenished. It’s also fairly easy to install and much cheaper to install than ground source. Typically, a water source unit can provide around 20 – 60 watts per square meter of water surface. Cost to install typically US$10K – 15K : £8K – 12K : €9K – 14K again, dramatically varying with location, complexity and size. 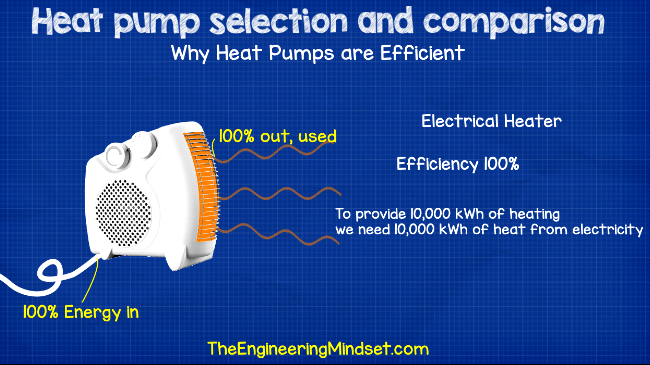 There are many standards used across the world for assessing the efficiency of heat pumps. I’m going to just cover a few of the most common ones focusing on units made in the US and EU. COP values or coefficient of performance is used worldwide for both heating and cooling, it’s simply the heating or cooling output divided by the electricity input. It’s not a good indicator of efficiency however because it only gives a snapshot of how a unit should perform under very precise conditions. For example a unit has a heating COP of 2.9 and that is achieved when the outside air is -3°C DB/-4°C WB (26.6°F DB/24.8°F WB) while providing 35°C (95°F) water for 8.3 kW of heating and consuming 2.86 kW if electricity. As the outside air temperature varies hourly and daily, this isn’t a good indication of efficiency. We reviewed the manufacturer literature of many air source units and found them to vary between 2.75 and 6.13. You’ll see this on European units to measure the average heating efficiency, it’s a much better indicator than the COP. The manufacturer has to test the performance of their units at different outside air temperatures. The unit is expected to operate for a specified number of hours at each temperature per year depending on where in Europe it’s located. 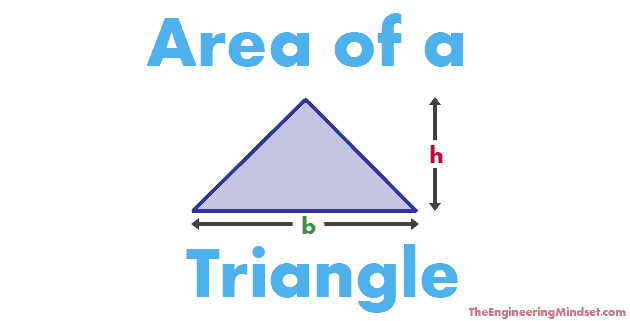 There are three zones. Warm, average and cold. The heat supplied and electricity consumed for the specified operating hours at each temperature is accumulated and divided to give an average COP for the year. The SCOP also considers the energy consumption for things like standby mode and crank case heating etc. You’ll see stickers on EU produced heat pumps which lets the buyer quickly and easily see how the unit is predicted to perform depending on which climate they’re in. We reviewed a number of air source units for domestic purposes and found the typical SCOP values to be between 3.9 and 5.2 the higher the number the more efficient it is. This is a measurement of a units cooling efficiency that’s mostly used in the US but is also used in the EU. 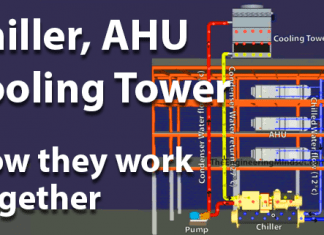 It’s a ratio of a units cooling capacity in BTU’s divided by the watts consumed to produce it. This is only tested at one condition, generally 95°F (35°C) outside air temperature and an inside return air temperature of 80°F (26°C) at 50% relative humidity, so it’s not recommended to use this to estimate your annual energy consumption or asses how the unit will perform in your location unless you live in a hot climate. However, it is a good way to compare units by different manufacturers for peak summer load. The higher the number the more efficient it is. EU – From the units we reviewed, we found units rated between 2.61 and 6.5. The SEER or Seasonal energy efficiency ratio is used in both the US and the EU on units which operate in cooling mode. Manufacturers will calculate their units SEER value by testing it at a number of different outdoor temperatures to represent a cooling season. 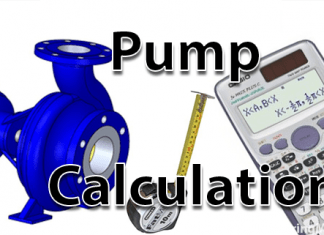 The units of measurement are different with EU models calculated on Watts of cooling per watts of electricity used and US models calculated on BTU’s of cooling per watt of electricity used. In both cases this is suitable for units installed in very average climates. If the unit is installed in a hotter or cooler part of the US or EU then it will not accurately represent how the unit will perform. So it’s a good way to compare different units but not a good way to calculate energy consumption unless you live in an area with pretty average weather conditions. Typically, you can find SEER values for US units between 14 to 24, and EU units between 5.25 and 7.2, the higher the number the more efficient the unit is rated. This is used in the US for the heating mode of air source heat pumps. It is the ratio between heat output in BTU’s over a heating season divided by how many watt hours of electricity were used to produce it and takes into account supplementary electric heating. 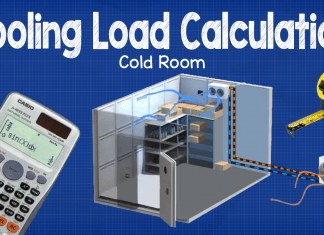 Manufacturers calculate their units HSPF from testing it at defined different temperatures to represent a heating season. This is an estimate of how the unit will perform and it may not actually perform like this in reality especially if oversized. It’s a good way to compare different units. Typically a unit will be between 7.7 and 14. The higher the number the more efficient the unit is. I really enjoy your videos on Youtube, I have used them to refresh my knowledge from uni and to expand upon it. I have a question for you. 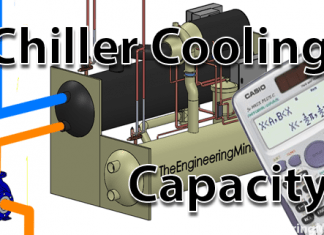 In an air conditioning system, the condenser coil needs to be slightly bigger in capacity than the evaporator in order to dissipate the heat that is extracted from the area we are trying to cool + the heat added to the system by the compressor. In a heat pump system though (air source) like a split unit, do both coils need to have the same capacity or again, one is sized larger than the other?